Nanimarquina, Asia 1 carpet: Like a walk through a dreamlike garden, this collection stands out with floral motifs done in relief, inspired by tranquil oriental atmospheres. Nanimarquina, Asia 1 carpet: Like a walk through a dreamlike garden, this collection stands out with floral motifs done in relief, inspired by tranquil oriental atmospheres. The design, available in three colours and two sizes, offers pleasing textures and dynamic visual effects, elegantly involving the senses of touch and sight with its presence. Its refined and simple nature is made up of shades like beige, petrol blue and brown. 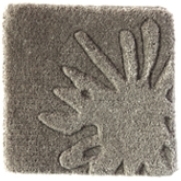 There is also the possibility of customising the colour of these embossed rugs.